The KickerBall by Swerve is not your average football/soccer ball. Inspired by the world's greatest athletes, we developed a patent-pending design that channels air differently than any other football/soccer ball. 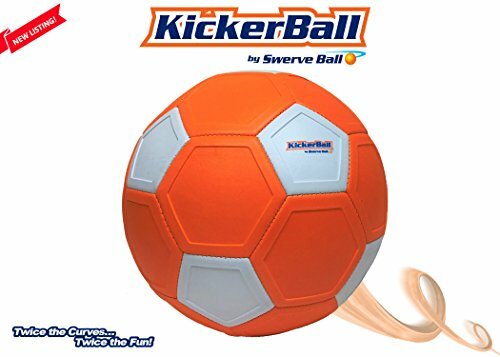 KickerBall gives EVERYONE the ability to swerve, bend, and curve like a pro! Created for kids, adults, or ANYONE who wants to learn cool tricks; the KickerBall will be your next favorite toy. We know you'll love it so much, we offer a 30-day money-back guarantee! Please note: The KickerBall is not a FIFA, NFHS or NCAA certified soccer ball; it is a TOY and should be used as such. Results may vary depending on your unique skill level. DO NOT OVER-INFLATE; over-inflating may cause your ball to "pop" or not perform correctly. To assure your ball is inflated properly, make sure the ball is not FIRM to the touch - this is considered over-inflated. A properly filled KickerBall should allow you to *slightly* push into the ball with both thumbs. Inspired by the world's greatest athletes, our unique patent-pending product design channels air differently than your standard Football/Soccer ball, giving you the ability to swerve, bend, and curve with ease! The KickerBall is between a size 4 & 5 standard football/soccer ball. Each KickerBall is made with special aerodynamic materials, making it lightweight. Suitable for boys and girls, ages 6+. If you have any questions about this product by Kickerball, contact us by completing and submitting the form below. If you are looking for a specif part number, please include it with your message. Pasiyou 4 Packs Cooling Towel (36"x 12"), Ice Towel, Microfiber Workout Towel,Fast Dry, Lightweight, Absorbent, Compact, Soft-Perfect Beach Yoga Fitness Bath Camping Gym Towels.